Revozport is a Chinese tuner, but one of its tuning arms reaches all the way to the UK. 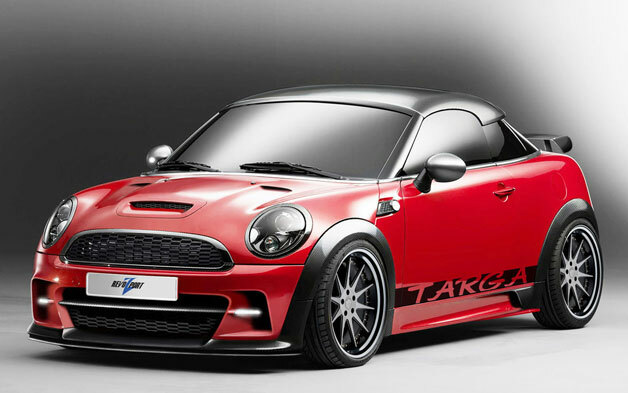 To reward itself for getting a particular ISO certification, its UK office put together the Revozport Mini Targa Raze, a program applicable to either the Mini Coupe or Roadster. It might be a smidge OTT, but it's not a bad job. With the help of Targa racing the motor gets ramped up to 250 horsepower, a 69-hp boost, to propel a car that is 66 pounds lighter, having swapped in 23 carbon and kevlar parts like the roof panel, vented hood and rear bumper and a titanium cat-back exhaust. The track front and rear is also 15 mm wider to fill out those new arches. No price has been mentioned, but if you're in Zhuhai, China in October you'll get a chance to see it in person.